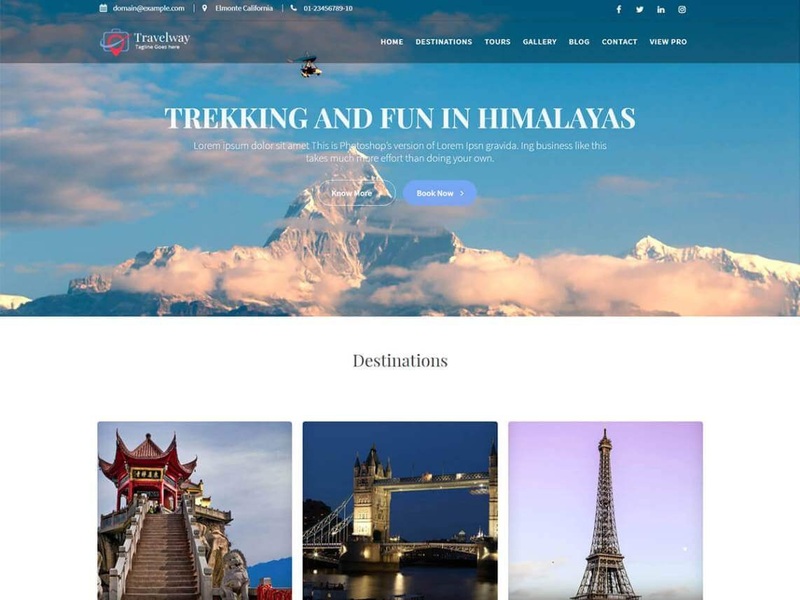 Travel Way is a splendid and highly responsive WordPress theme designed and developed especially for a tour and travel companies, agencies and personal travel portfolio sites. The layout design has been made using modern and best technology such as awesome fonts and enchanting graphics. Travel business owners can take most benefits of this theme and explore their business globally by showcasing their services, tour packages, destinations, and other aspects. Using the Woocommerce plugin and its add-ons extends the functionality of the theme to sell or book travel and tour packages online. The theme is ready for Gutenberg editor. Other exciting features include WordPress Live Customizer, Page Builder Compatible, Unlimited Slider, Advanced Logo Options, Custom Sidebar Areas, Layout Controls, Category Color Options, Social Media Integration, Breadcrumb Option, Translation Ready and much more. Besides that, it can also be used for several other purposes like fashion, portfolio & blogs, news, corporate, events etc.